Today I was asked to describe what I bring to the SAP team I am part of with one word. I chose optimism because I believe that attitude changes everything. 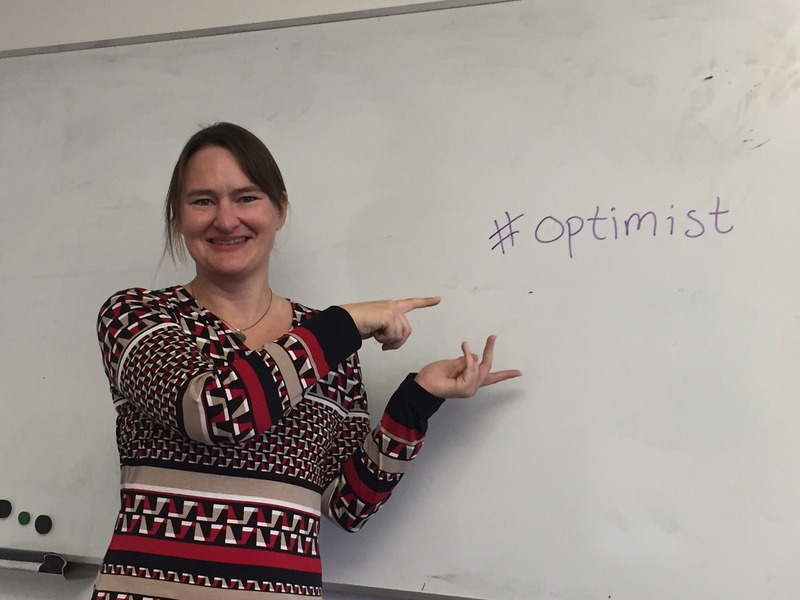 Optimism is a requirement for positive change and it is key to all the leadership principles I believe in. I´m lucky to have the opportunity to lead, to drive change and to have an impact. I know others have to fight harder to get their voices heard, to be accepted, to bring their diverse talent, perspective and value to tables where decisions are made. Early in life my father gave me a kick in the you-know-where when I tried to take the easy way out of a challenging situation that was also an opportunity. He didn´t just kick me though, he also made it very clear with his actions, not just words, that he was there to support me if the push would make me stumble or even fall. That combination of challenging and helping people be successful was one of my first leadership lessons. Unfortunately, my father is no longer around to see where his advice took me, but I still strive to make him proud of the values he taught me. Carmen O´Shea was one of my first managers and she shaped my career more than anyone else. She showed me that leaders come in different shapes. Preparing for this interview years ago made me realize that I would never have chosen a management career without her, simply because I thought the alpha male stereotype was the only “template” for a leader. She showed me that I have qualities to lead that are far more powerful than if I try to be someone I´m not. I know she has inspired many women to lead, and I am eternally grateful for role models like her. Denise Broady is an amazing success story herself and one of the most important lessons she taught me is to always do the right thing, even if it does not pay off short term. In a corporate environment, it can be tempting to compromise on values to get ahead. Or to be discouraged if doing the right thing is not rewarded, thinking it was a mistake to do it. Denise showed me the importance of only winning with class. Maggie Fox opened my eyes to the power of assuming the best intentions. She said it more eloquently but her message was: If you go into a situation with your fists up, don´t be surprised if you get a punch on the nose. You can´t win alone and you have to trust to be trusted. If you expect a conflict, that´s what you´re getting. One of the best learning environments I have ever experienced is the SAP community. I have found some of the smartest people I know here. But what impressed me even more is their generosity and passion for sharing their knowledge. They demonstrate the power of helping others without expecting anything in return. The more you give the more you get, and the lesson is that it comes back to you in ways you can´t predict. +1 on the power of Maggie’s mantra to “assume the best intentions.” I’ve taken that one with me too. Both on the work front and personal front it has such a powerful effect, especially in stressful situations. It does require optimism and trust, and even empathy. But when you can bring people around to that perspective in a heated moment, it has such a diffusing effect — and opens the door for a productive dialogue that can get to the root of the problem, rather than the emotions of a stressful situation or misunderstanding. Totally agree with you Caroleigh! This is definately a base to start effective conversations with. This blog is a must-read and keep-in-mind blog for me, whenever (in challenging situations) I need to remind myself that I’m an optimist. Malin I am honored that you count me as one of the influencers in your career but YOU have made your own success happen too. You live these mantras above as well as being diplomatic, collaborative, and really smart and creative. We are better for knowing you and learning for you. Keep on rocking! Excellent blog, Malin! I have been the beneficiary of much of what you learned on your way to becoming an amazing leader. I have grown and changed and been challenged in too many ways to count over the last few years of knowing you, all to the betterment of my leadership abilities, my business acumen and my drive for change. Thank YOU for being an immense influence on my life and career. I am always on the lookout for ways that I can pay it forward!